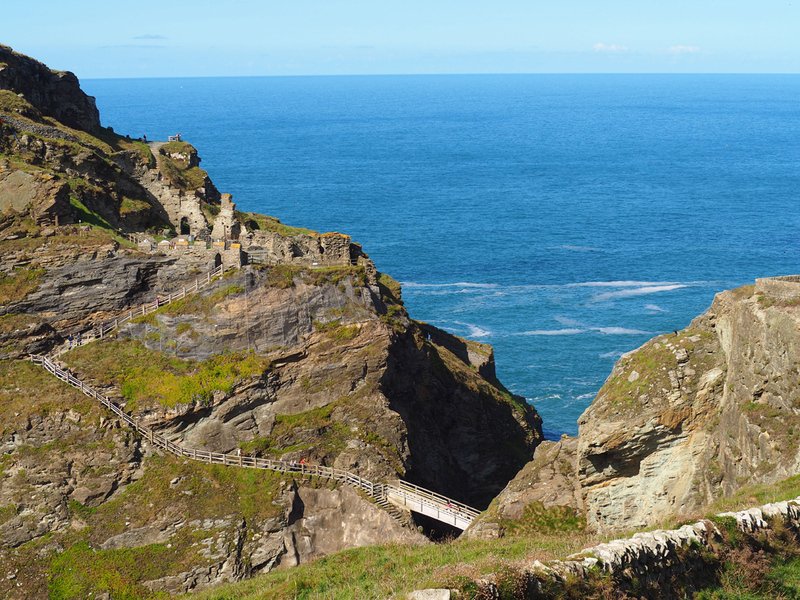 Tintagel in north Cornwall is a little village with a big story, it has long been associated with King Arthur. One of the first buildings you come across as you walk down the main street, is the Old Post Office. 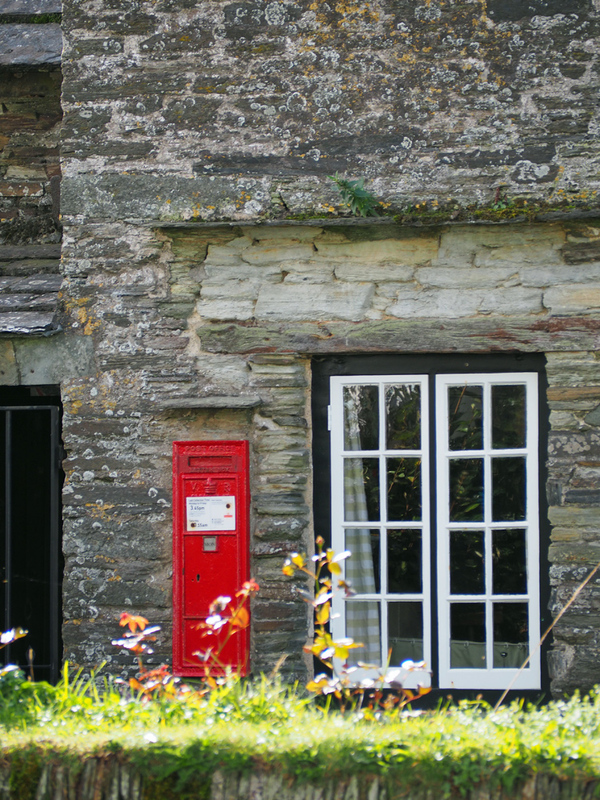 Dating from the 14th century,this grade 1 listed former manor house became a post office in the 19th century. It’s now looked after by the National trust. I was trying to avoid people, so it’s hard to see the wavy shape of the roof. 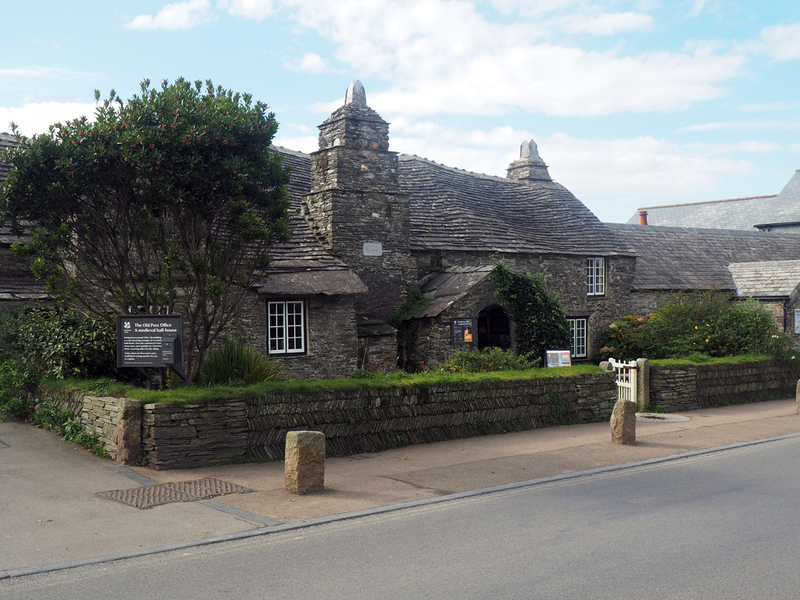 The village is one of the most visited places in Cornwall and hence has many touristy souvenir shops. 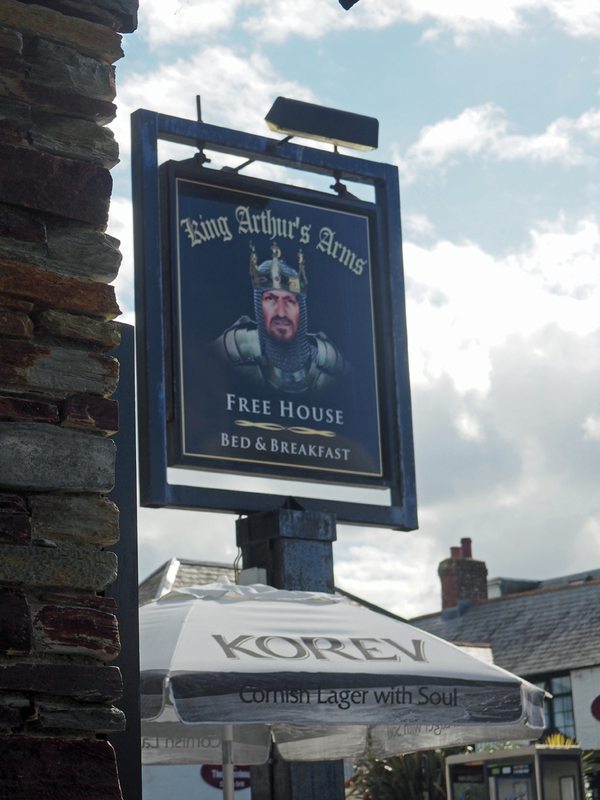 and had a tasty pub lunch. It was wonderful to be able to sit outside, in full sun even though it was October. All fuelled up we walked down the village, perhaps a hundred yards in the direction of the sea, and took a left turning from the road. 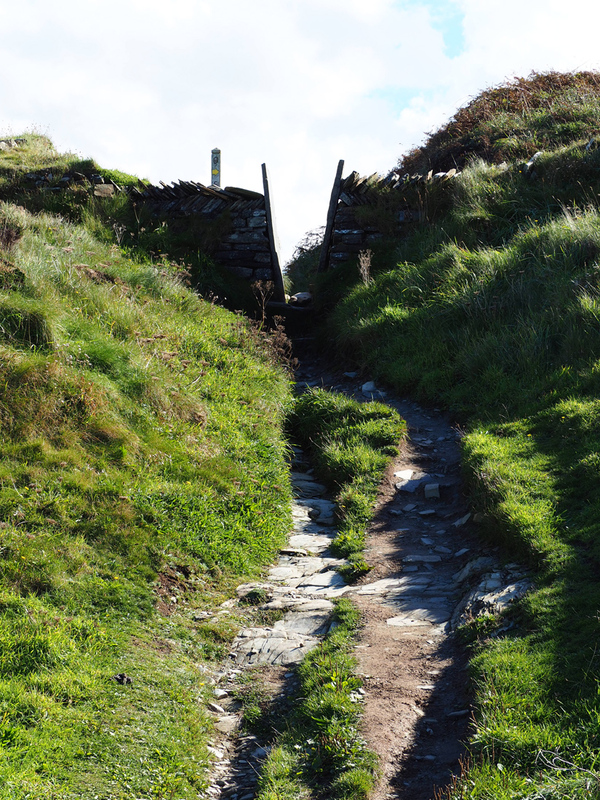 This is the lane that leads to the coast path and the castle. 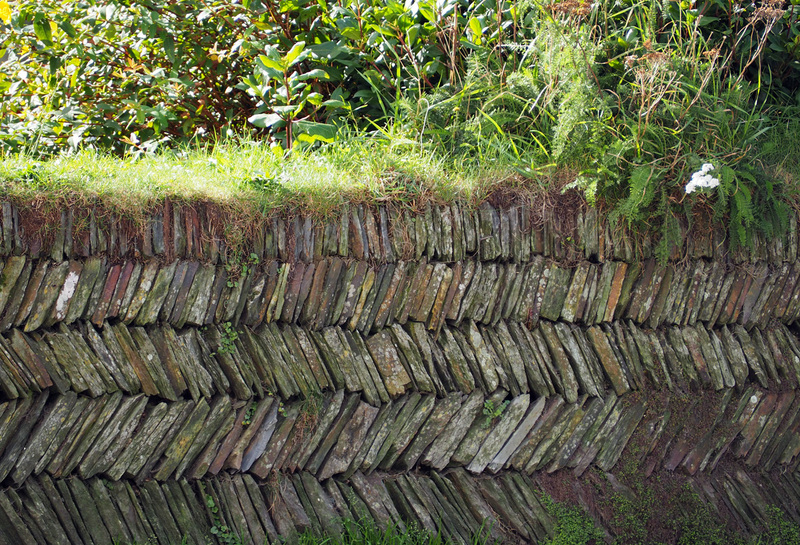 We passed this beautiful example of a Cornish dry stone wall. 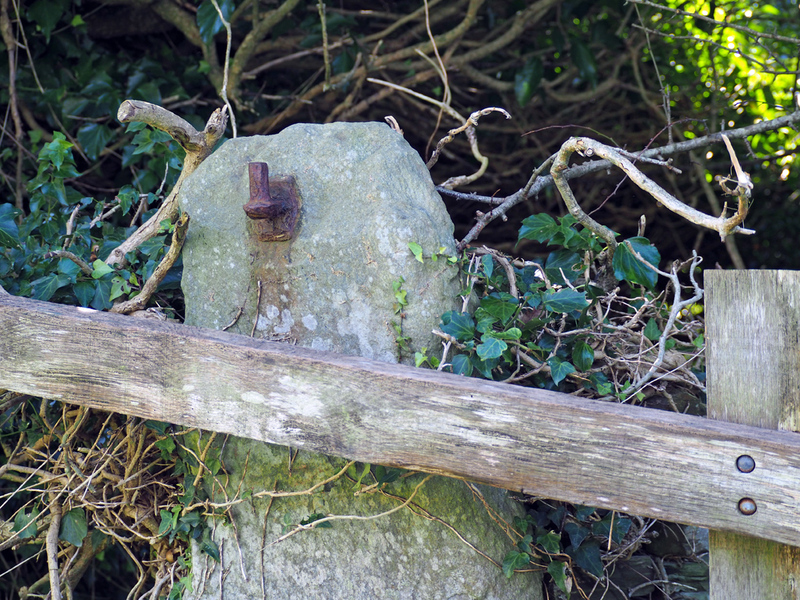 This old gate post shouted out ‘please photograph me’, knowing I’m not the only one who would like it, I thought it was my duty. 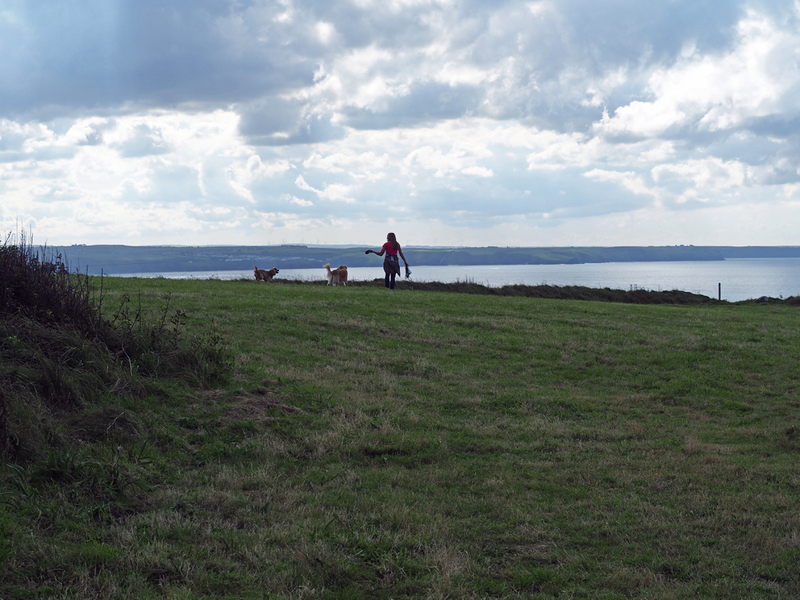 The track continued down towards the sea, but we took the footpath leading to the cliffs. It’s too late for the Thrift this year, the pink flowers will be back next spring, meanwhile the lichens and mosses cling on. 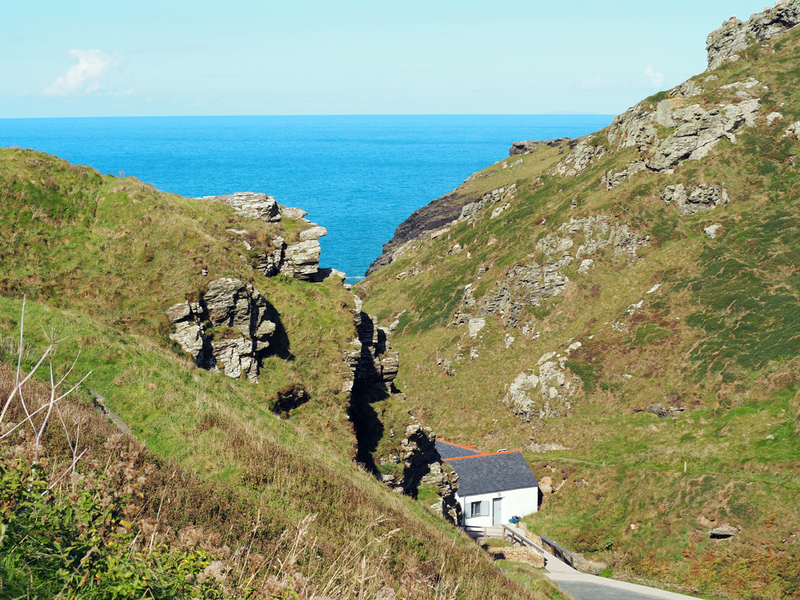 Looking down from the footpath, our first glimpse of the turquoise sea. It could be a Mediterranean island. 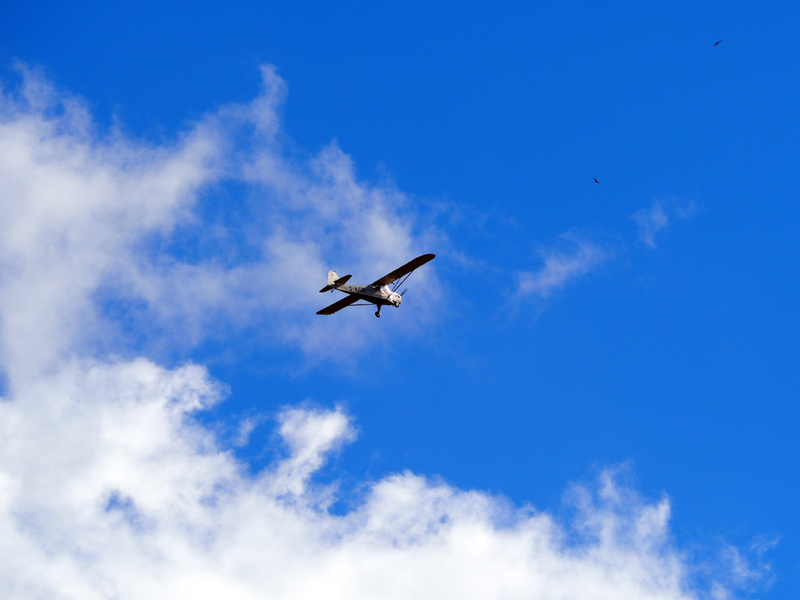 And above, a different shade of blue, and what a fantastic view the pilot of this plane had! I’m happy to settle for this view, of the amazing craggy rock stacks. Across in the distance was the way to the castle, an English Heritage site. If we were earlier we might have had time to justify the entry cost of £8 each, but for an afternoon stroll we preferred the peace of the hill. So up we went, and then he came down, crazy guy, I wouldn’t have had a hope of staying on a bike on that track. 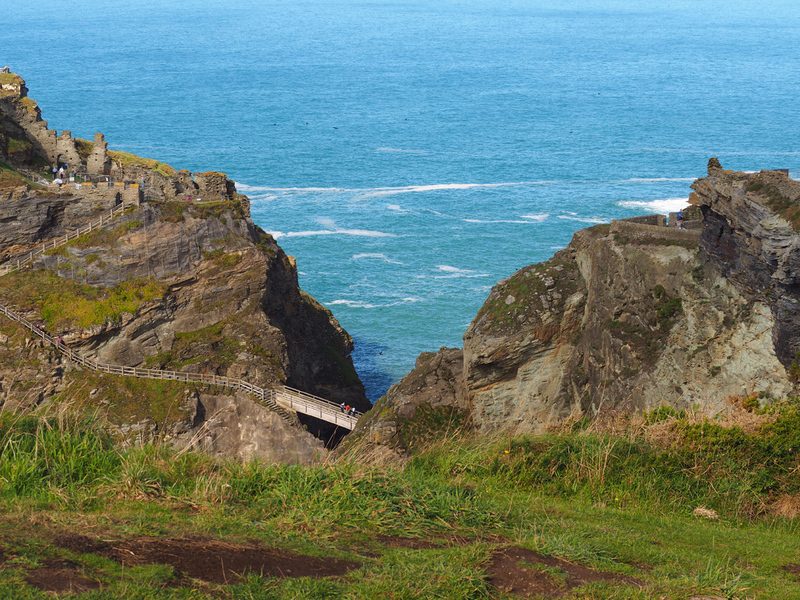 Through the narrow gap at the top of the path, the view opens up of the footbridge leading to the castle. I don’t think that footbridge would be everyone’s up of tea, do you? We’ve made it up the hill though, and so have they, how clever bringing their own seats. A few well places benches up here would be wonderful. Never mind we’ll walk on. It isn’t very far along the top and should you prefer driving there’s a car park at Glebe cliff, that I think is National Trust. 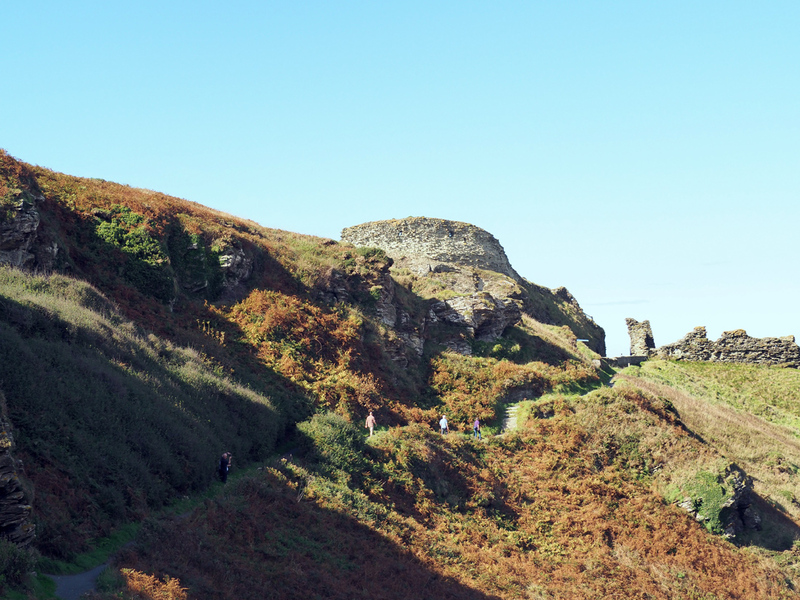 From there you could walk east towards the castle, and enjoy the views while avoiding any climbs. 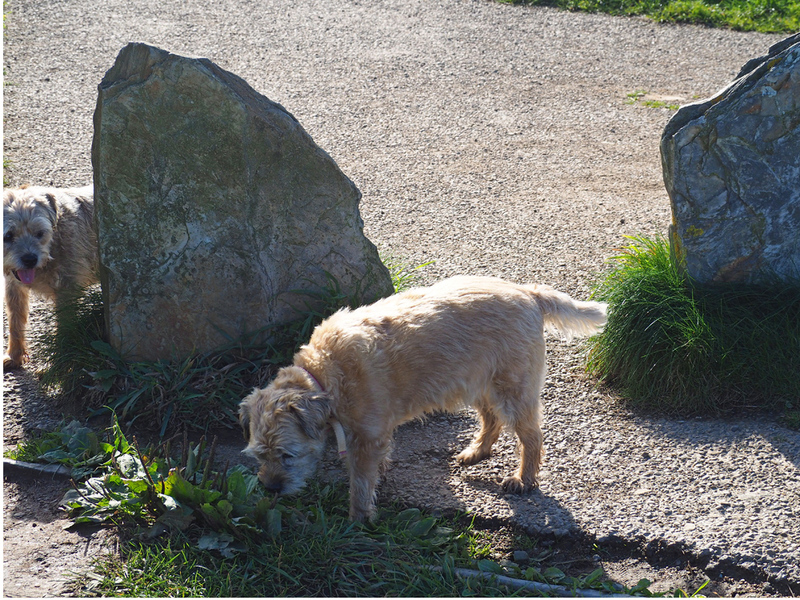 It’s a great place for dog walking, Dido and Daisy were happy. We left the sea behind to look in the church, and there were more stone walls. 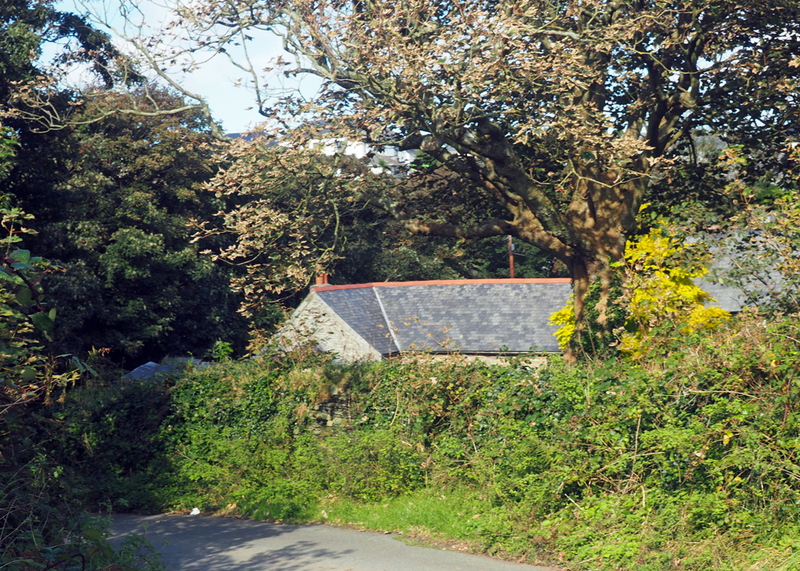 And then a lane leading back to the village. A last look at the Old Post Office – for now! I’m sharing this walk with Jo, visit her Monday Walks to see where her other friends have been this week. 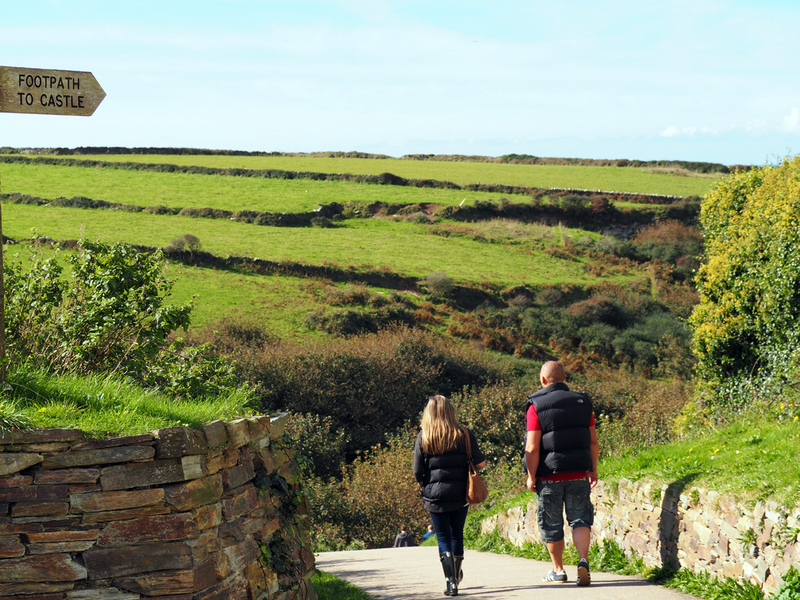 Mine is a mere two miles, but worth it if you’re in the area and you can always walk the whole of 630 miles of the South West Coast Path while you’re here. What a great walk Gilly, and great that you walked it. 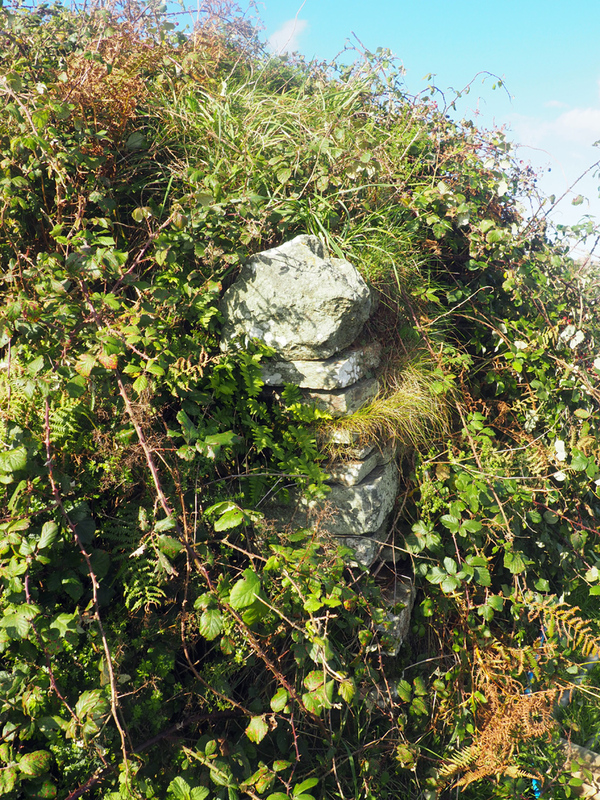 I love the rock stacks, and the fence, and the Cornish drystone wall, and the blue sea – and the whole walk, really. Thank you for a Sunday treat, and for making me long for such a walk. I’ll have to seek one out here! What a glorious walk, Gilly! I’d love to do that one with you, and we could pop inside the castle as well. 🙂 🙂 I’m sure I’ve been down that way with Dad many, many years ago, but I have very little memory of it. 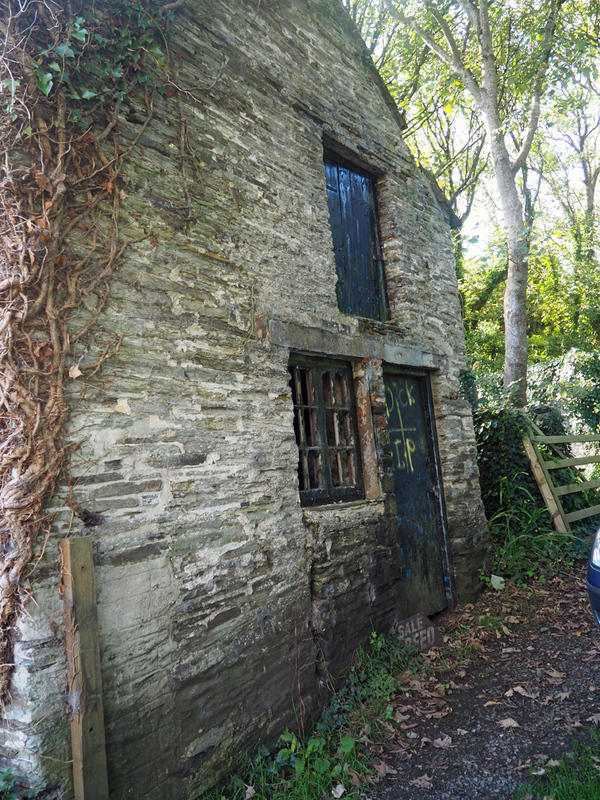 Thank you for pointing out the wavy roof and that lovely close up of the Cornish stone wall. I love the sequence as you ascend towards the castle and then down again. I love stacks! You can catch them every which way 🙂 Thank you so much, darlin! Hope you’ve made the most of your weekend. Wet here today so I just did Sunday lunch. Are you eating ‘normally’ again? Tests/meds to follow? Hugs, sweetheart! 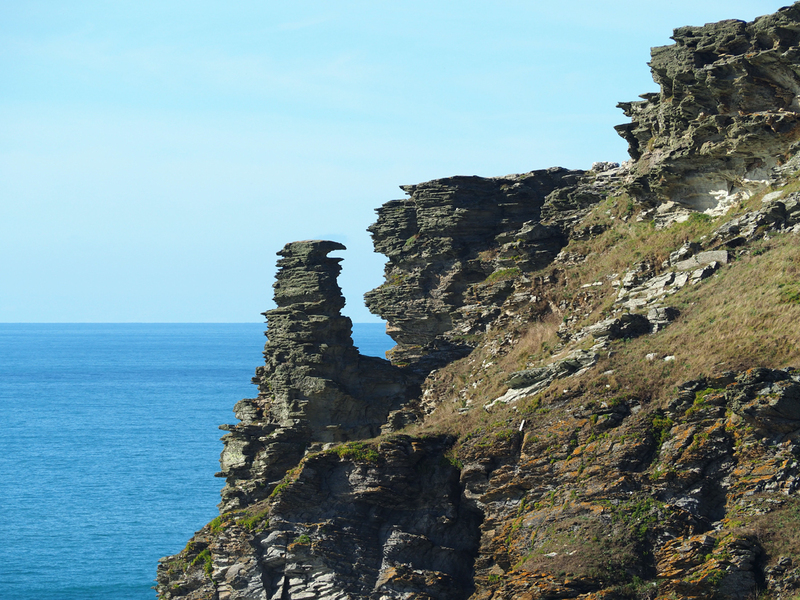 It was my first visit to Tintagel for many years and I’m glad it was October, it would be heaving is season! I’ve been trying to post this for weeks, glad you like it! 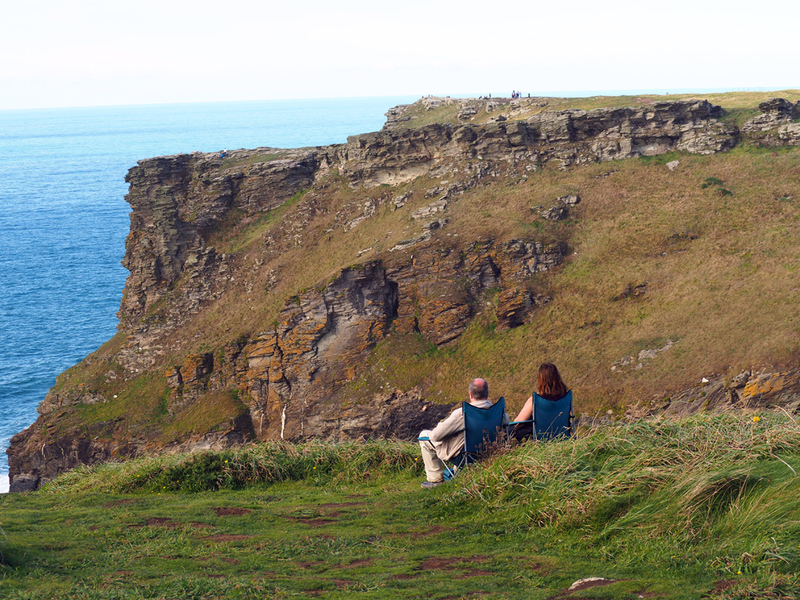 You would love the SW coast path, there’s a tv series about it at the mo, Friday nights I think on bbc2, just half an hour. I’ll look out for it 🙂 I had thought early Spring would be a good time. No real clue what I’m doing next year, or when 🙂 Writing another leafy walk. Take good care of yourself. What a romantic place to visit. That footbridge looks scary though. Oh what gorgeous photos. Just glorious. Love the cliffs and the stone walls. I actually have been to Cornwall, many years ago. Beautiful part of the world. You captured it so well. 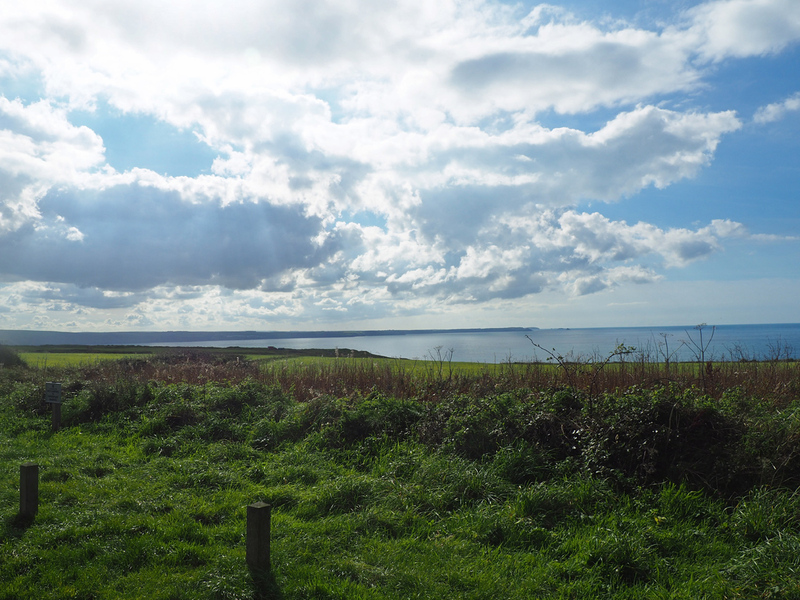 I’m very fond of Cornwall, but not of swarms! Yes there is a minibus, it would help, going back the same way as down would be a straw too far. But I only went upwards, vaguely remember going across with bridge with a grumpy OH myself many moons ago! This is a place of magic and legend… beautiful place… thank you for sharing this Gilly.. I expect you’ve been there at some point Gerry? Very long time ago I’m afraid..
I’m glad you enjoyed the stroll Amy, it’s just a mile or so of the 630 that make up the SW coast path! I was a very little girl last time I walked here and the only thing I remember is the climb down and then back up from the footbridge!! I think the footbridge is in better condition than it was when i was a child, although that was way before your time! Only the odd year or two! This is an exciting walk, Gilly. With each step new vistas are open. I keep going back to that portrait shot of rock close-up that I like so much. You have been to England a few times haven’t you Paula? But probably not the south west? No, just London, Windsor, Stonehenge, Oxford and Blenheim Palace. Wonderful place and nice narration. Thanks for sharing. Wow, what a lovely place, makes me want to go back to the island!! I love the photos, too. 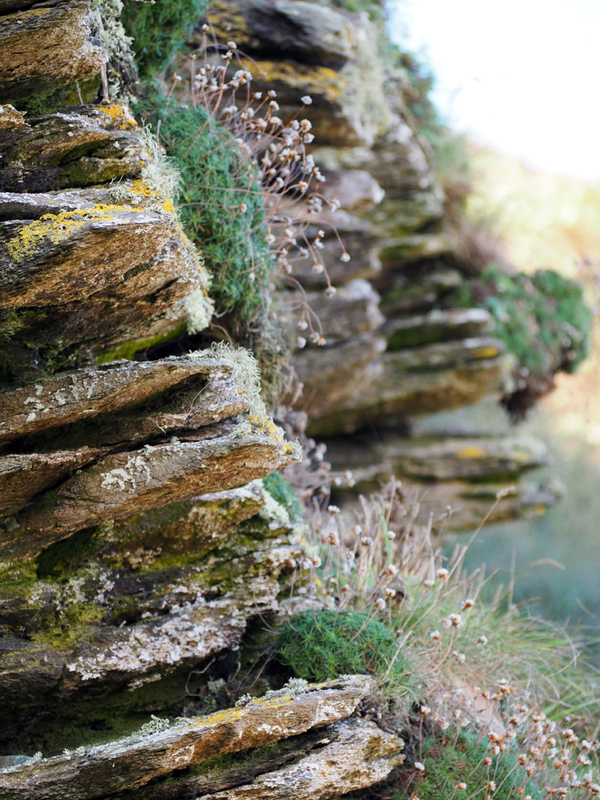 Especially the closeup of the rock, great depth of field! 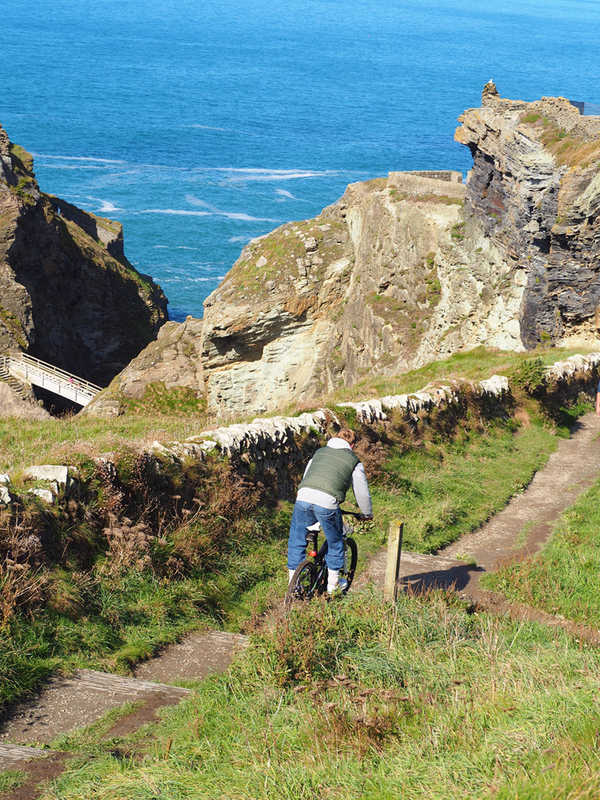 And yeah, that guy on the bike, what…going down rock steps on the thing?!! I’d try it…once. Beautiful, beautiful, beautiful!!! My kind of place and “adventure”. And I wouldn’t mind the bridge. 😉 Incredible and excellent photographs of the place too. Thank you for taking me there!